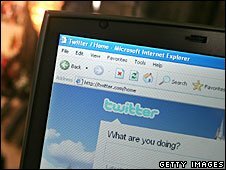 Staff who use Twitter and other social networking sites while at work are costing UK businesses £1.38bn every year, a report has said. Over half of those surveyed admitted using social networking sites during the working day for personal use. On average those people spent 40 minutes per week on these sites. IT services group Morse, who commissioned the research, said that such online behaviour clearly had a "productivity strain" on firms. The survey questioned 1,460 office workers. "The popularity of social networking sites such as Twitter and Facebook has grown considerably over the last couple of years, however with it has come the temptation to visit such sites during office hours," said Philip Wicks from Morse. "When it comes to an office environment the use of these sites is clearly becoming a productivity black hole." Although many businesses have banned the use of Facebook in the workplace, Morse said that firms still had "some way to go" when it came to Twitter. Over three-quarters of respondents said that their employer had not issued them with specific guidelines with regards to using Twitter. "Without guidelines and usage polices businesses are leaving themselves wide open to a reduction in productivity, brand damage and security risks," Morse said. It added that companies should think about protecting the reputation of their brand. A third of workers admitted they had seen sensitive information posted on social networks. However, 84% said they felt it should be up to them what they posted online.